Time to Amend s 44 of the Constitution? It is settled that an unsecured creditor to whom a trustee has properly incurred a liability in the administration of a trust may be subrogated to the trustee’s right of indemnity out of the trust estate in circumstances where the trustee is insolvent or where obtaining judgment against the trustee would be futile. This is the only method available for the creditor to recover value from the trust estate. An alternative for the creditor to recoup its debt might be to seek subrogation to the trustee’s personal right of indemnity against the beneficiaries of that trust; however, Australian case law has proven this to be a murkier proposition. This article traces the judicial development of the unsecured creditor’s remedy of subrogation to the trustee’s personal indemnity in Australia. It contends that such a creditor may be subrogated to the personal indemnity without the need for it to exhaust all of its remedies against the trustee. Legislation in all Australian jurisdictions provides for those disappointed with what they received, or did not receive, from the execution of a will, to challenge it. Originally conceived to protect wives and children from grossly unfair testamentary provisions of husbands and fathers, these provisions have substantially expanded from their original basis, to include many other types of claims, and claimants. As will be seen, the prospects of success of such a challenge are surprisingly high. It is the objective of this article to challenge the current orthodoxy, on the basis that the case decisions reflect, generally, an insufficient regard for the wishes of the testator. It is the author’s belief that, in such cases, the starting pre-disposition should be one of deference to clearly expressed wishes of any testator of full capacity and that judicial interference with such wishes should very much be the exception, rather than the norm. Just over 100 years ago, the Testator’s Family Maintenance and Guardianship of Infants Act 1916 (NSW) was enacted in New South Wales. It consisted of two parts, the first relating to what has become known as family provision law and the second relating to the guardianship of children. This article is limited to the former. 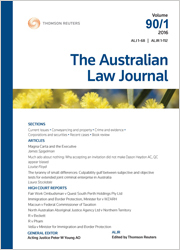 For the PDF version of the table of contents, click here: ALJ Vol 91 No 9 Contents.